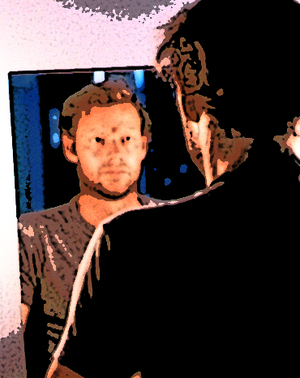 Have you ever turned a corner or walked through a door, and unexpectedly found yourself facing a mirror? For a moment, you experience yourself almost as a stranger. You see your face in a new way before you manage to straighten it, so that you again see what you expect to see. The experience is always powerful. But we prefer to live on memories and on what we think we already know. When the experience, nevertheless, hits us in an unguarded moment, we quickly push something between it and us. We get used to it. The experience becomes limited, just as we limit our senses. To experience one’s own personality is to not hold any set views about it − or believe that one already knows it. 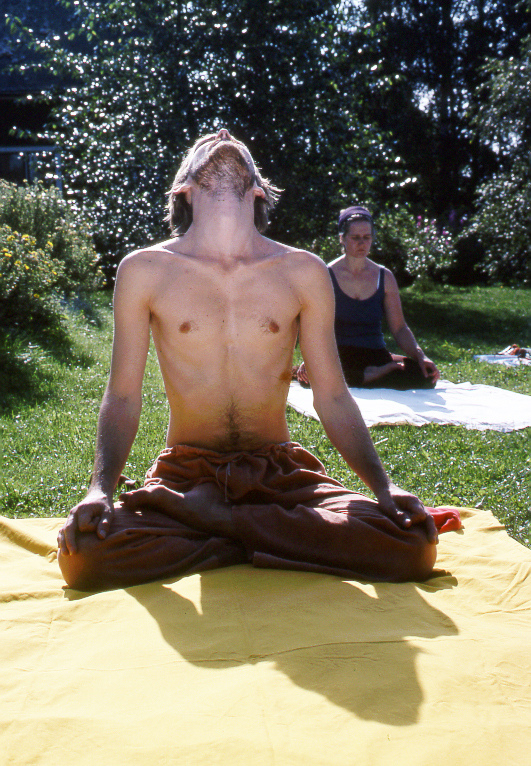 There are yoga exercises, like the headstand or the bellows breathing technique, that sometimes have a interesting effect on certain people. When you stand upright after doing the headstand or when you hold your breath while applying root lock and chin lock after doing the bellows, a powerful change in your condition can momentarily occur. If the experience is overwhelming, perhaps you will become dizzy or get a feeling of losing consciousness. But if you are aware the moment it comes and don’t tense your stomach or change your breathing, then you will experience an unusually powerful feeling of being present. You can also have an experience of concentration, of directing your mind towards one thing and becoming completely absorbed in it. Your field of vision narrows and you perceive only that one object you are concentrating on. One thing is concentrating, and another is expanding your awareness into the whole situation in which you find yourself − becoming one with your surroundings as a whole. This kind of awareness, you can use wherever you are and in whatever you are doing, as a means to become present. It is also useful when just coming out of a relaxation or meditation. Sit for a little while and feel one with the surroundings, before you do other things. Alternating between the two will deepen your state a little each time you go from one to the other. Many a tantric meditation is based on this. How do we relate to our experiences? When facing any experience, we can, with varying success, try to keep it at a distance. We may hold ourselves more or less open or we may be dulled by our habits of everyday life. “I travelled the old road every day, I took the fruits to the market, my cattle to the meadows, I ferried my boat across the stream and all the ways were well known to me. One morning my basket was heavy with wares. Men were busy in the fields, the pastures crowded with cattle; the breast of earth heaved with the mirth of ripening rice. Suddenly there was a tremor in the air, and the sky seemed to kiss me on my forehead. My mind started up like the morning out of mist. I forgot to follow the track. I stepped a few paces from the path, and my familiar world appeared strange to me, like a flower I had only known in bud. Have you ever been at a children’s theatre and watched how the children in the audience let go and live the performance? In The Little Theatre in Copenhagen, I have sometimes seen children go up on stage with the actors, or with their typical lack of reserve, contribute from their seats as if they were active members of the show. How do we learn to relate to life? 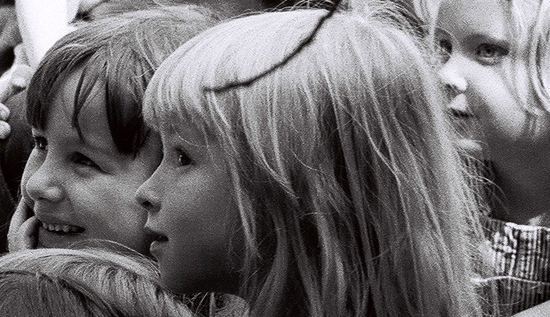 Can we, while among friends or co-workers, allow ourselves to experience like children do? Once, while travelling through Europe, I went to see a local film in a university town in order to get used to the language again. It was a kind of mystery movie, or perhaps more of a psychological drama about the fate of some people. It was a film one could easily let oneself become fascinated by. Sitting behind me were a couple of young students who obviously wouldn’t risk letting themselves be taken in by the film. They kept avoiding the experience of the film by making critical remarks, sarcastic comments and jokes. For me, it became a question of balance. I succeeded in experiencing the film, and at the same time listened to the students’ fear of letting go in the face of this very powerful film. Strangely enough, they didn’t dare allow themselves the experience that one must assume they came for. Do you find the truth when you impress your preconceptions on that which you experience? We can experience life in different ways. Either we remain open and take an active interest in life, are inspired and creative, find tasks to do, take initiative and meet with response. Or we make reservations for everything we meet, both people and events. 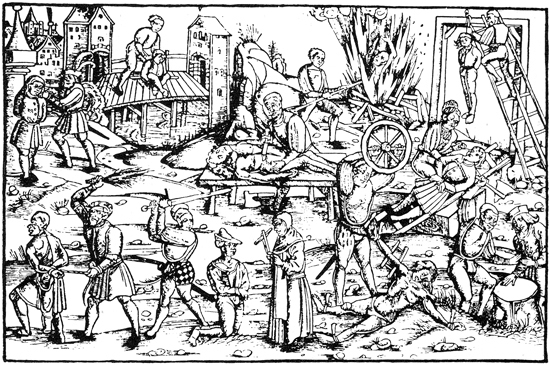 A moral reservation, for instance. “We cannot just live life as we find it, there is too much immorality – it’s better for people to restrain themselves!” Of course, here, I’m speaking of morality for morality’s sake, when it springs out of our fear of life, fear of relaxing and being a little tolerant towards ourselves and everyone else. I definitely think that we should show consideration for each other, even though we might be required to be a bit more attentive and not just follow conventions. Identifying yourself with the tasteful and aesthetic also results in reservations. If conditions are not good enough, calm enough, or pretty enough, not properly social or artistic, then I don’t dare risk experiencing or being myself and feeling at ease here and now! You can also believe so much in development that you confuse being, existing and living, with amounting to something, and ‘getting ahead’. To where? Every time you begin something, you hurry to get it finished so you can start something else which also must be finished − at the end of life lies death. Once, I heard a story about a little girl who was permitted to pick a flower from a large garden. She ran into the garden and saw a beautiful flower which she was about to pick when she saw another which she thought was even prettier and larger. So she left the first and was about to pick the second when she saw a third… by the time she reached the other end of the garden it was nightfall and suddenly there were no more flowers. So she had to go home empty handed. In his fairy-tale Jack the Dullard, Hans Christian Andersen shows us just the opposite of this story. You become inspired by what you are doing now. You learn togetherness from the people you know now. “But we live in a time of crisis, and that’s why we can’t begin anything worthwhile.” Tell me, is that an excuse? It seems to be usable any time, throughout life, throughout any life. When you react to something, judge someone, or make a reservation, then acknowledge it for what it is! Ask yourself, “Why am I afraid ?” — and experience your fear. Make it clear to yourself. Allow yourself to have it and feel it. Then you’ll be rid of it. Jnana Yoga, the underlying subject of the first part of this article, is concerned with the relationship between two things: That which is experienced and the one who experiences it. When we want to deal with the fixations of the mind, it is necessary to go slowly forward, step by step; otherwise, we might give up the whole thing from the start. We must first understand the process confronting us. The restless surface of the mind must have a chance to calm down before its deeper inclinations can find expression. The over-active or tense mind often maintains an exaggerated control over thoughts and feelings; an unconscious fear that some unknown danger might lurk on the other side of the relaxation. The mind must be given the opportunity to ‘let go’ so that we can allow our true feelings and memories to surface and be experienced fully. Then we can again achieve the ability to experience and become inspired. Raja Yoga − the yoga of mastery of the mind − talks about right perception and understanding, and about wrong perception and misunderstanding. Regarding yoga and meditation, one can either have all kinds of expectations, for or against, or one can just start using the exercises and experience the effects. Various Hatha Yoga body cleansing processes; yoga postures; breathing exercises; methods to meet with and let go of outer influences; relaxation exercises and finally concentration methods. In the tantric tradition, we may or may not regard these exercises as a prerequisite, but they are, at any rate, a help in bringing us closer to the meditation. And meditation is a process where we move towards unhindered insight and experience. This is accomplished by using various techniques. We must first sharpen our powers of observation, and then use these powers to discover what comes between us and the experience − that which we consciously or unconsciously identify with − and then let go of it. Thus, we can be, and remain, what we really are, who we really are. This is called the power of discrimination. After we have started on this path, the next step will be the realization of that which we formerly understood only in theory − we feel the effects of the exercises. After a while, we attain a real ability to relax and concentrate. The closer we come to a pure experience of being, our own and everything’s being, the stronger our insight becomes, and we leave behind the limited perception of intellectual understanding and imagination, which is often based on preconceived ideas. We are now, to a higher degree, capable of clearly visualizing our deepest thoughts and goals. A truly tranquil mind releases us from our striving, impatient ambitions, allowing us a greater overall view. Periods of reaction disappear as there is no longer anything being suppressed; instead, we live on the basis of our own being. By stabilizing this step, we eventually reach the next: an inner feeling of happiness, which transcends our normal understanding of the word. But even this feeling of happiness is in itself a limited state compared to that of being one with life. Love, which we talk about, demand, and display, is in a way, also limited. Higher and truer than that is the experience of unity, unknown to anyone who remains in the world of judgement. The result is that we rest within ourselves in the free state (Kaivalya). Liberated from that indoctrination and learning, which we have had to remember and follow, we now act from within ourselves, in harmony. Our actions become part of still larger contexts. There is no one to ask – but we communicate. There is nothing to ask about because, wide awake, we experience the situation we find ourselves in. We act from this basis and solve the problems that show up. There is no one to blame or criticize. The mind is no longer something we dependently identify with − it becomes a useful instrument. We follow our intuition. We don’t approach life as we did before – we live with life, in life. We are. Can you unconditionally accept where you now find yourself? No matter on which level you think you are, can you experience and respect the current conditions of your life – as your starting point? Without this acceptance, you can’t expand the mind. To face things without being overwhelmed, to remain in a powerful or difficult situation till it is over will make you master of it. Perhaps you hate the times you live in, your country, your culture or those who are different. Perhaps you’re suspicious of people in your own or related professions. But what sort of high ideals justify such feelings? How do you think your subconscious is affected when you see enemies everywhere? If you have such demands on the world and on life, do you expect to be met with understanding? If you can accept your present situation, then you can get rid of many depressions and worries. You will get a more general view of things and the courage to really do something worthwhile. You won’t need any excuses to withdraw. Notice every time you reject a situation or are dissatisfied with yourself. Catch that negative attitude in the act. Realize that it is just a habitual thought that anxiety has imposed upon your mind. No one says that you have to believe everything that goes through your mind. Put yourself in a constant state of accepting all that happens, experiencing everything unconditionally, minute by minute. Let go and let everything pass. This capacity is trained in meditation. Coming face to face with a problem and looking it straight in the eye will slowly eliminate unconscious fear. This often requires guidance and help, which is best obtained by unconditionally (or as well as you can) accepting the complete personality of another individual. I mean, another living human being with whom you are not busy demanding things of or trying to reform. And not only the composure and experience the other person possesses, but also his or her distinctive character, whims and ability to react to your feelings. This could also include a whole group of people with whom you share a communal way of living. Let yourself be involved, or experience a state or situation without reservation, so that all that happens to you is that you become more aware. If you can accept someone else’s personality, then begin to accept your own in the same manner – if you do, then others will do the same. The world’s best trainer, Milarepa’s guru Marpa, was one of the most dreadful persons one could imagine. He was very drunk the first time Milarepa met him out in a field. When Milarepa asked him directions, he behaved like a simple ruffian, who hardly knew where Marpa (himself) lived. It was not the last time he was drunk, nor the last time he was unreasonable, but from that day onward and during more than 12 years struggle with Milarepa’s problems, the foundation was laid for one of the greatest gurus in the history of Tibet. Milarepa could now continue on his own, into the solitary realm of deep meditation, and if we are to believe the ancient texts, he developed the most astonishing abilities, like the time when a little boy in a mountain valley asked his father, “What is that flying up there?”, and the father, to his great surprise, looks up and sees Milarepa flying from one mountain top to the other. And who was it that gave Milarepa his start? Drunken and choleric Marpa! With a wife who consoled Milarepa when everything got too impossible, and at that point it really was impossible! But Marpa knew that he could go far with this strong, highly developed individual. He couldn’t do that with just anyone. If you wish to live together with others, in an ashram, and enter into a relationship with a teacher, then it is important not to make excuses or beat around the bush, not to play self-righteous – or feel wounded in your dignity and position. Throw yourself into it. You need not be perfect. Be yourself. It is the best and the easiest way. The individual who is involved in your training and co-operates with you, may not give you any special attention, but just lives a natural life in the same surroundings as yourself. In reality, the trainer is the one who takes the risk and the trouble in every situation. In dealing with you, he or she dares to act without reservation and in confidence that you will not choose misunderstanding − and, like a ‘stranger’, go around scowling and interpreting everything that happens − but that you will take an active interest and join in. It involves not just another person, but a whole situation and a group of other people; different people, some like yourself and others more or less experienced than you. It is important that you don’t impatiently feel yourself an outsider and think constantly about doing something else. Instead, you begin to take the initiative, to create your own conditions and use your abilities − you live naturally with others and solve common problems. This you can do by being part of the whole, by being aware. The most common situations and the most ordinary incidents can be powerfully experienced and arouse strong feelings. In these situations, your consciousness is open and sensitive. Yoga and meditation keep you awake and you will have little chance of becoming dull. It is not a question of how long it takes. It all depends on you. There are people who are ‘clever’ and quickly find themselves a ‘role’. Then one day it appears that they have nevertheless been clinging to self-centred ideas and built up a defence of judgements. However, it isn’t giving up your meditation and training that makes the big difference, but the fact that you dare return − to the meditation or the situation. You cannot run away from an unsolved personal problem. Sooner or later, it will reappear in one form or another and then it is usually more difficult to solve. It is the same with thoughts. Let them come up and admit them. The thoughts you repeatedly suppress finally end up as almost unsolvable tensions. This is the attitude you adopt again and again: Look at everything that happens to you as training or experiences, then the whole world is your teacher. Does it do any good to write about experiencing? After all, it’s something that has to be lived, isn’t it? To quote myself: “It is like a man who would rather read a novel about love than visit his beloved”. Many people are impatient, also people using yoga and meditation. Their impatience makes them imagine a lot about what they have not yet experienced; and they mistake these fantasies for knowledge based on experience. The effects of yoga and meditation ought to be investigated with a well-balanced use of these methods. And this investigation should be done by yourself, supported by a good and sober guidance. It must be a training where one learns to distinguish between what really happens during meditation as opposed to what might have been programmed into your mind by speeches, books and teachings of fearful or boastful individuals. Nevertheless, literature can be useful. What we don’t recognize as possibilities, what we don’t know can be done, we are less likely to discover and investigate. We have been raised, both in the West as well as in the East, to regard reality as what we are told it is! − and to hold on to it. 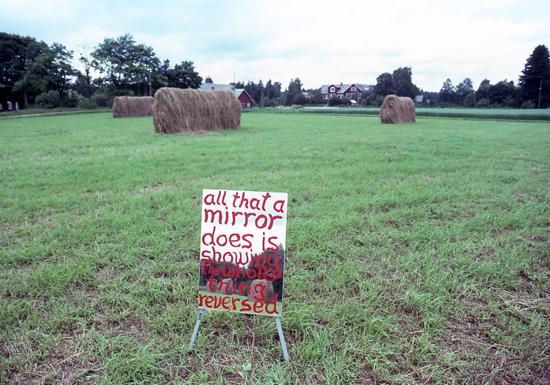 All that doesn’t belong to the prevalent world-view, we never even hear about − no matter which world-view it is. We are told beforehand which possibilities we have. If we wish to break through the barriers of accepted ‘truth’ and broaden our horizons, it is often from literature that we first receive this possibility. While quite young, I read a couple of books that stimulated me. The first one suggested different possibilities in life from the kind I had previously experienced. The other book gave me a perspective on my own life and reinforced the thoughts I already had. The German writer Stefan Andres’s novel “Voyage to Portiuncula” ( Die Reise nach Portiuncula) represents this first influence: it is about some young people of the previous generation, who decide to travel to a remote district in southern Italy to live a simple and intense life in a little cottage. They attempt to experience life on their own terms without the constant influence from inherited norms found in ordinary restless society. Their action was inspired by the American philosopher Henry David Thoreau and his experiment described in his book, “Walden, or Life in the Woods.” It relates to a period in Thoreau’s life when, in the solitude of the forest, he learns to experience life intensely. (from H.D. Thoreau : Walden, or Life in the Woods ) . Thoreau became an active citizen whose ideas about society and human rights later had an important influence in the American social structure. But he found time to do what he needed to do, and his disappearance into the woods for a couple of years gave him that special independence that enabled him to make a difference when he, later on, took an active part in society. That a person could determine his own life to such a degree was a great inspiration for me. Sure, I probably went through a phase of nature romanticism, but this literature, which also was to include works of many others, like Søren Kirkegaard from Denmark and from Switzerland (German), Max Frisch’s “Stiller”, told me primarily that it was possible to make a choice, to be conscious of myself and my life, to be my own master. 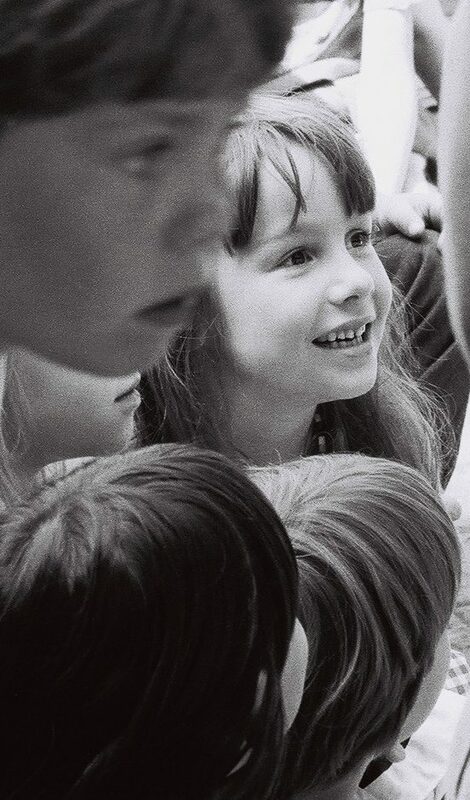 It taught me that a person doesn’t have to succumb to the authority or opinions which are forced upon him while growing up, by priests, politicians or teachers; that it is possible to remain aloof and remain oneself with everyone; that the polite smile, the shyness, and inner tension that make you smaller than you really are, is not at all necessary. On the contrary, it is much better, also with others, to be honest to yourself and show what you go for, without regret. I knew very well that this wouldn’t be easy. However, the need to stand on my own had been there all the time, even though it was sometimes hidden under a layer of dreams. Contrary to what the Bible teaches, the law of Jante forces one to hide one’s light under a bushel, even though nothing happens in the name of group consciousness which could justify such a demand. Therefore, when someone dares to be themselves and show their light, the mechanism of Jante’s law is soon set in motion. The direction of my attention to these possibilities and perspectives through literature fulfilled a natural need. And when one day I attended a lecture on meditation and later bought a book on yoga, I found out that even deep-seated limitations that may inhibit my ability to live and experience, can come for a day and be relinquished. I realized that if I really wanted to be a master of my life, then here was a tool I could use. I began to work with yoga on my own. Not long after that, I also had the good luck to experience yoga as a tool, which could strengthen my ability to concentrate and live intensely − it was when I joined a pantomime group and the training that this involved. Luckily, there were no occult dreams or fantasy worlds to live up to, but nevertheless, the two hours of yoga, with which we began our daily training, had an effect. When you devote yourself to yoga and meditation, don’t be overwhelmed by what various people write and say about these subjects. Depend on yourself. Cut with a sharp razor: between your way of experiencing, your insight and your goal on the one hand − and on the other, fantasies and expectations, whether they are expressed by others or yourself. In meditation, the absence of genuine first-hand experience can easily lead to idealistic beliefs about what you ought to achieve. Striving to get experiences one has heard about or imagined, makes one forget to follow the technique. Thus, the meditation is ruined by the hunt for experiences and one’s efforts to achieve something other than what comes naturally – the essential remains obscured. Actually, it doesn’t matter whether or not you have ‘experiences’ during the meditation. The inner experiences indicate that the mind is allowed to blow off steam, and this is natural. Even though it is possible to obtain certain capabilities and powers, you won’t be happier by identifying with what passes through your mind. After the experiences, comes the experience, peace, clarity and true identity. whenever you have an opinion regarding something, about which you don’t really know anything in the first place. each time, you count on something, because you think it probable, but not because you know it. Begin with the little things in everyday life: Do you know – or are you guessing? Can we, through yoga and meditation, learn to openly experience anything? Can we acquire the ability to keep ourselves open and receptive, so that inhibiting and regretting mechanisms don’t immediately come into play when the experience comes to us? Can we experience a memory − without immediately telling ourselves something about it, or dragging forth similar memories? An uncomfortable feeling − without shutting it out? A pleasant feeling, a desire? Can we conquer the fear of undauntedly experiencing what we experience anyway − without fighting against it? Dreams enable us, in an altered or symbolic form, to experience what we were unable to experience or realize yesterday. Therefore, dreams are also a natural help in reaching back to what we are unconsciously influenced by, and getting it experienced. However, that is not the immediate subject of this article. Yoga poses, breathing exercises, relaxation (Yoga Nidra) and meditation strengthen the ability to experience without becoming tense − and they also give clearer dreams. I refer especially to meditation, and the relaxed and attentive meditative state, as a help to get along with this work. This is a state in which the activity of the brain drops slightly (into alpha activity) so there is time and space for the mind to express itself. In the ordinary busy waking state (beta activity), it is too difficult and inconvenient to notice the almost invisible inhibiting mechanisms. A large part of meditation can consist of teaching yourself to keep your hands off whatever enters into or happens in the mind − to let it be. The inhibiting factors are preconceptions and expectations, as said before, but also analysis, interpretation, justification and judgement. On the whole, any commenting chatter, also within. But above all, the experience is obstructed when we identify with what we experience. Therefore, the free state of the mind is furthered by de-identification, and this is what we train in a meditation like Inner Silence. Once the mind has had an experience, it has a tendency to want to ‘recognize’ that experience again. The idea of what it is may get ahead of the actual experience and block it. How can we avoid predicting or expecting anything and remain open to what actually happens? Get to know the meditation − follow the method each time just as you learned it, without trying to do anything else. Let whatever experience that comes, come and go. Experience it, and then return to the technique. The ancient symbols Sun and Moon describe two functions that have been known to yogis for countless generations − and which are just beginning to be understood by modern psychology − regarding the functions of the brain’s two halves. Yoga describes how two currents wind up through the spine to the brain. They concern two aspects of our being. One current represents the body’s energy and physical activity, including the energy in the nervous system and the brain. The other current relates to the mental aspect of our being − the mind. Here, we’ll limit ourselves to two short definitions, in deference to the main subject. (For further reading, I refer you to the sections Swara Yoga and Kundalini Yoga in my book Yoga, Tantra and Meditation in Daily Life). comprehending and being in totality . The Direct Path Home, “Sushumna“, the third Function: Of course, both functions and both sides of the brain are necessary, but what is also needed in our being is balance and communication between the two. Many yoga and meditation exercises help to promote or sustain this balance. Here, I’ll talk about the innermost, and perhaps most effective and fundamental aspect: the consciousness behind − the one who is aware of both sun and moon, and who also experiences itself. One day, scientists will be able to measure the state where there is balance between the two brain-halves and their functions. They will then be able to confirm that the moment this balance is optimal, the brain and central nervous system are supplied with more energy than is normally present when only one of the two functions is dominating. This dominance, according to yoga, alternates round the clock. The balanced state, however, can be called forth and is especially dominant during meditation and during The Twilight Hour. When you experience the mind with its contents of thoughts, feelings, sensations and images; at that moment, it’s important you realize that you are the one who is experiencing this. Relaxation (Yoga Nidra) and meditation train you to calm down and let happen what is happening anyway in your thoughts and feelings – without interfering with or interpreting anything. In your sleep, when you dream, things happen by themselves in the same way. You let your mind process its content and deal with it. All that you do in meditation, is to consciously observe the activity of your mind and release your grasp on it for a moment; then you dissolve the automatic patterns of reaction or the bindings, that normally keep us in certain states and attitudes. Thus, you become free to choose your own way of thinking and make your own decisions. No longer will it be necessary to give habitual or second-hand answers to everything that happens. And a creative state of the highest degree may be allowed to arise. De-automatization is a concept that is used to describe this process in the mind during meditation: how it becomes possible to release yourself from vicious circles of, for instance, stress and depression. Automatic processes also manifest as tensions in the muscles and as habitual reactions in the nervous system. They can become de-automatized with a regular and steady use of authentic yoga postures and breathing exercises. Nor can it be brought about with strenuous or hectic exercise. A little about meditation techniques and the attitude behind meditation. Let’s see how what we have dealt with in this article can be applied to meditation. Stick to stability and succeed. Your thoughts and your attitudes towards life influence the future. Impatience results in expectations. Patience grants the time to experience reality as it is. Impatience is busy criticizing tradition, adding and subtracting. Patience allows thorough testing, to the fullest. Calm down and go deep with one thing, then its effect will also be deep. The one who is hungry for knowledge cheats himself by running from one thing to another. He seeks the sensational or the fashionable. Why hunt for rules of universal validity? So you can set the autopilot and fall asleep again? Do you wish to be influenced to live like a machine, after certain prescribed programs? Or do you want to find out what is behind it all? It cannot be done by memorizing principles, and nicely accounting for your ‘knowledge’. To whom? You must count on yourself. If you meditate, then you are the one who does it, and the one who develops. And then it makes no difference at all what others think about it. You won’t find too many fixed points in life. Why cling to reservation when you can join with life? It changes from day to day. So does meditation. It can be experienced differently each day. Sometimes it’s easy, sometimes strenuous. Don’t judge it. Just go along with it; you are the one experiencing it. I am not the concentrator; I am not the meditator. Meditation is personal, and it doesn’t demand results and experiences. Science can get lost in its demands for achievement. Even therapy can induce people to boast. When we ask for effects, we forget to let go and be part of what is happening right now. To experience in meditation means to release control, to allow the mind to think and feel by itself, to perceive without censoring. The result is that you can cooperate better with your mind instead of keeping it in check with tensions and fear of the unknown. Life is not just therapy and exercises. It is also something that happens by itself and, as it unfolds, it leads to greater maturity. We get the most out of it when we go along with it. Look upon the nature of meditation as being just like the nature of life − something you give yourself to and see unfold. When people begin to meditate, they are very open and expectant. And because of their fresh openness, they have many spontaneous experiences. Later on, they can’t understand why the same things don’t come again. There are periods when meditation becomes routine. This happens because we forget to follow the meditation and instead, sit and wait for experiences we have had to pop up again, or expect to have experiences we’ve heard about from others. Some wait for the Great Revelation. But a revelation is something that reveals itself. It comes when it comes. By giving up the idea of achievement and forgetting about demands, we have a greater chance to get to know deep tranquillity and insight. Experience what you experience. Don’t try to create any special state beforehand. Don’t put yourself into a ‘meditative’ trance. Do not do anything except follow the technique. What do you see when you close your eyes? Nothing? Or do you see light, or scenes of your surroundings from before closing your eyes? Here is where meditation begins. It goes without saying that the meditation is supported by yoga and breathing exercises, and in addition, these things make us healthier and more sensitive and focused. But, it is no good only to be in a hurry or to be so ambitious that you believe everything can be accomplished by strain. To rest in oneself, to experience what is − is advanced meditation. Don’t try to understand your thoughts. Just experience them. 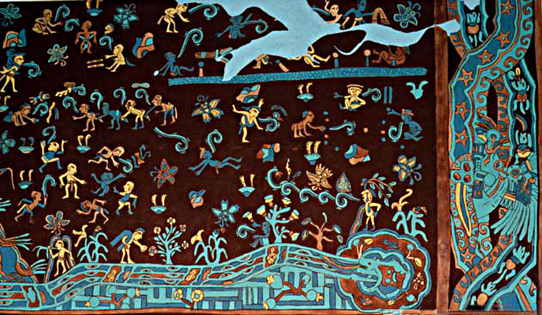 Mural from Teotihuacán depicting paradise. (This culture flourished in Mexico and was in contact with the early Mayans). The curls coming out of their mouths indicate song or speech. The one in the lower right hand corner has just entered into heaven and cannot keep quiet. or make you aware, when you try to suppress it. Being silent in a chosen environment for short or long periods, strengthens your ability to be present in yourself and experience others. Your awareness, whether inner or outer, is sharpened to a high degree. Silence is most effective when you are together with others who are silent and, at the same time, learning or practising meditation. At our retreat center in Sweden, we have silent periods, lasting from 2½ to 30 days. During such periods the brain gradually sheds habitual tensions. The face becomes softer and the mind opens up to new possibilities. The ancient yogis call this a less than mild approach. Those seekers who are a little more serious are discreet. They are known to be meditating and using yoga exercises and that is all. No one knows, however, what the most ardent seeker is doing, or that he is doing anything at all. What he does, he does silently for himself. That which benefits others is not his personal experiences and insight, but the energy, the perspective, and the vigour that he gets from meditating. In that way, he can also work for the benefit of others. How he gets his perspective and energy, he keeps a secret. Experience the condition of the eyes during relaxation and feel how they relax fully. During the day, notice when your eyes are tense and when they are relaxed. Read a book while you consciously and continuously relax your eyes. You will discover that it’s difficult to keep the content of the text at a distance, that you can hardly avoid having an open experience of what you read. Do you dare try? When sitting in the meditation Inner Silence (Antar Mauna), or anytime you close your eyes and experience your thoughts, then relax your eyes in the same way. After using this exercise for a short while, you will experience basic changes in your capacity to experience. The techniques that follow are: inner and outer Tratak (intense concentration); the Psychic Symbol; certain practices in Yoga Nidra (deep relaxation); and finally, the tantric meditation that I emphasize the importance of in this article, Chaya Upasana , ‘to meet with or sit close to your shadow’, your own form. All are alike in that they strengthen concentration and awareness and the ability to experience. 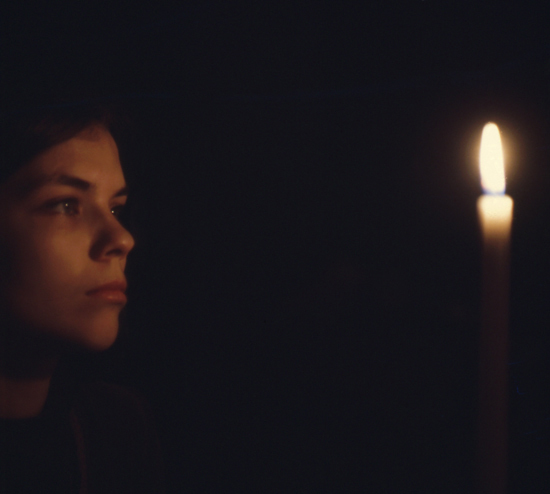 Tratak, with a candle, is a necessary exercise in preparation for the other methods I have mentioned here. Outer Tratak (concentration on the flame of a candle) ends with focussing on the after-image of the flame on the retina. The dot you see when your eyes are closed has been caused by the flame you were looking at. When you succeed at watching it for a while with closed eyes, then notice how the spot disappears. What is happening in your mind? Did you forget it? Are you thinking of something else? Is there something covering it? What’s happening? In Inner Tratak, you visualize different pictures before your inner eye. Notice when it is successful and when it isn’t successful. How do you feel? Are you in a hurry? Are you tense and straining for results? And when you finally see something clearly, does it stay for a while? Or does it quickly disappear again? Notice what is happening. Breathing exercises like Kapalbhati (the bellows, which cleanses the front part of the brain – see Yoga, Tantra and Meditation in Daily Life, page 56 under Hatha Yoga) and especially Nadi Shodan (Alternate Breathing, pages 43, 49 and 81), will also strengthen the ability to concentrate, when practised regularly. The same thing applies here as with Inner Tratak: evoke and retain your personally chosen psychic symbol before your inner eye. Your psychic symbol can be of central importance in your work with yourself. You will constantly return to it. When does the symbol appear? When doesn’t it appear even though it should? Is it easier to experience at certain times? What is influencing it? What is the significance of the psychic symbol in an advanced and individual exploration of yoga and meditation? Your psychic symbol is guarded by silence. When no one gets to know about it, it retains its power. You choose it yourself. Once the psychic symbol begins to appear in your meditation, you keep it for life. At the close of the little Yoga Nidra, when you have become so relaxed that you follow the instructions without straining, you are guided to see your face in a mirror. Does your face appear suddenly and clearly? Or must you think about how it normally looks when you see yourself in a mirror? And when it appears, how does it disappear? Refer to chapter 9 in my book, or to the CD Experience Yoga Nidra, the first practice The Wholeness of Your Nature. Chaya Upasana is an important meditation in the tantric tradition. It is one of the methods that bring you closer to a part of your being of which you are not normally conscious, and that you normally cannot contact through ‘thinking’ or ‘understanding’. The perception you gain is beyond the limits of language, and therefore gives you an experience you are not used to. In this way, it becomes revealing and brings you closer to the experience of yourself. I learned Chaya Upasana directly from Swami Satyananda, during the time I lived with him in India. What I write in this article about Chaya Upasana is based on his teaching. I have, however, been inspired to also quote from Swami Rama’s description of this in the article Meditation on the Shadow Man. The shape of your body is all about you. Your shape is unique. No one else possesses it. Your shape, your mind and your life correspond to one another. For example, your fortune can be told by measuring the various dimensions of your body and comparing them with each other. I once had it done in India as a young man. The lateral circumference of my cranium in relation to its vertical circumference, in proportion to the breadth of the shoulders, compared to the height of the back and so on. And the portrait I got corresponded exactly to my background in the past and also to a great extent to what has happened since. It is rather logical, I suppose, that your appearance and the shape of your body correspond to your mind and personality. The shadow is used in a similar way to reach into your personality, but deeper, and without entertaining any ideas about it. Such ideas would only stand in the way of the insight. 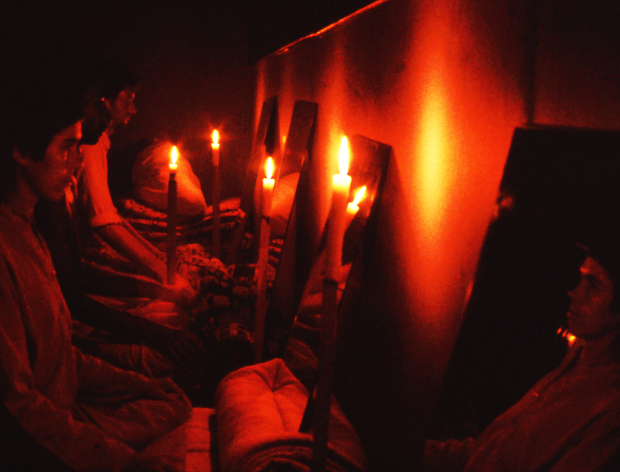 For the one who has been initiated into the secret Tantric tradition, there is nothing new in the fact that the shadow can be a gateway to the subconscious. Our own culture contains a knowledge of this too, or at least has a notion of it. Just think of the fairy tale, “The Shadow” by Hans Christian Andersen, and what the shadow represents there. Or how Carl Jung used this concept in his psychology, where the ‘shadow’ in his world of ideas, symbolises the unconscious mind and its repressed weaknesses, shortcomings and instincts. It helps you more than any other technique to see the inhibiting functions in your mind. Through this method, you will learn to witness how the mind shuts itself off from an extremely relevant experience. You will also be able to notice the material the mind uses for distracting the attention. In this way, meditation will give you knowledge of the more profound aspects of your personality, parts of your being which you would not otherwise be able to perceive. However, as hinted above, it requires practice with both this and other techniques, preferably Kriya Yoga or Ajapa Japa, and also Inner Silence. Inner Silence is an absolute prerequisite − not only the knowledge of it, but a personal experience with it! So that the meditation is not based on analysis or understanding, but on something you observe. You will see the shape of your body as a shadow and later you see the after-image as a golden form. And as mentioned before, this form tells you something about yourself that language is powerless to evoke or convey. When you are in practice and can hold the golden body for a longer period of time, you will experience a deep calm meeting this − your own form. It puts you into immediate contact with a powerful feeling of being. Apart from this, Chaya Upasana is said to give special abilities. It confers what can be described as a strong capacity to see beyond the normal limitations of the mind, you could call it a highly developed intuition. Chaya Upasana is a really advanced form of meditation, which a beginner perhaps cannot appreciate. But on the other hand, an inexperienced person with a spontaneously open mind can reach so deep, that I once again feel the necessity to advise you to obtain experience from the techniques mentioned above before you begin using this method systematically. Choose a sunny day with a cloudless blue sky. Go out in the middle of the morning or mid-afternoon and sit in the sunshine. If possible, undress to the waist, so that it is the form of your body and not the form of your clothes that you see. If you have long hair, then tie it at the back of your head so that it cannot be seen on your shadow. Sit in a meditation pose with your back to the sun, so that your shadow is in front of you. 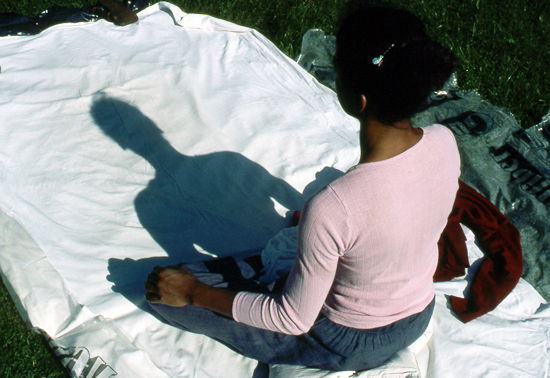 The time for the practice is determined by the size of your shadow. It must neither be unnaturally long nor so short that it disappears under your body, but preferably have a size, that corresponds to the natural size of your body. Close your eyes, sit absolutely motionless and wait until you are calm. Then become aware of your body from within, with eyes closed. Let your mind take in your whole body all together, the body in its entirety while sitting absolutely still. Your consciousness is now the size of your body and fills out every cell. 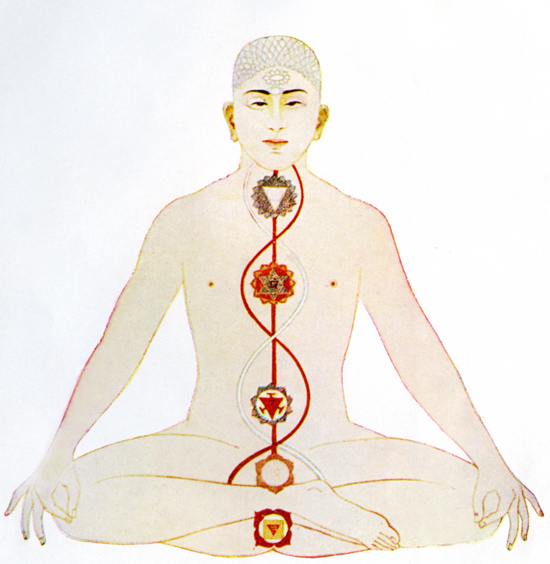 When you begin to experience the unity of consciousness and body, then concentrate on the centre of your throat, Vishuddhi Chakra − and become aware of your breath there. Continue with this until you have reached a state of tranquillity. All the while, you are sitting still without the slightest bodily movement and with your eyes closed. Experience how your breath is flowing in and out through your throat. Having become completely calm, open your eyes and look directly at the centre of the throat on the shadow without blinking, without moving in the least and without disturbing the breath. Keep your gaze fixed on this point for, say 4-5 minutes, while sitting motionless and while maintaining the calm state you reached in the first part of the meditation. Then close your eyes and remain completely stable, without expectations or demands. Your eyes remain relaxed. After a while, your shadow will appear before your inner vision as a golden form. It is important that you do absolutely nothing else but keep still. Keep looking at the impression of the shadow on your retina − until it disappears. Now comes the moment that requires you to maintain your relaxed state, while at the same time remaining extremely alert. In a short while, your body’s golden form will disappear from your inner vision. Retain the form as long as you can and at the same time, notice what represses it. What shapes move across it? Does the edge become blurred and start to dissolve? Does the background within the golden form change colour, which eventually melts into the surroundings? Which colours do you see in this short period of time? Which colour is dominant, especially while the golden form is disappearing? This can be different from time to time. When the form has disappeared and you have examined what happens at that moment, and you are sure it will not reappear, then carefully place your palms over your eyes so that no light is admitted, while at the same time avoiding pressure on the eyeballs. Relax your eyes under the palms, perhaps even blink. Keep your hands there for a short while, and when again you remove them, keep your eyes closed. This will probably make the form reappear for a short time, before you see it disappear again. It is also possible that the form, the golden form, will expand and fill out your entire inner field of vision so that all becomes light. Keep experiencing this light, until something covers it, or you forget it. This meditation cleanses and stabilizes the mind. The more you practice, the easier it will be to keep the form before your inner vision. Then become one with it. Identify completely with it. Instead of closing your eyes after looking at your shadow on the ground, keep them open, bend your head back and support your upper body by placing your hands on your knees. Look steadily up at the sky until the form appears in the blue. 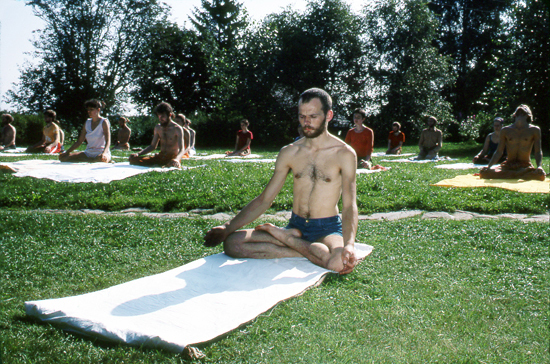 When using this method, you must sit so that you are not being blinded by the sun, and there must be no clouds in the sky. Be sure that nothing else will come between you and the expanse of blue space. This article was written in 1980. In 2010 and 2016, it was revised by the author and illustrations were added. 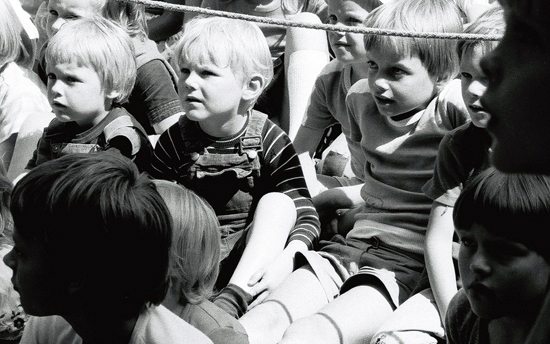 The photos of the children in the beginning of the article are by Hamsananda in Harbergen, Germany. 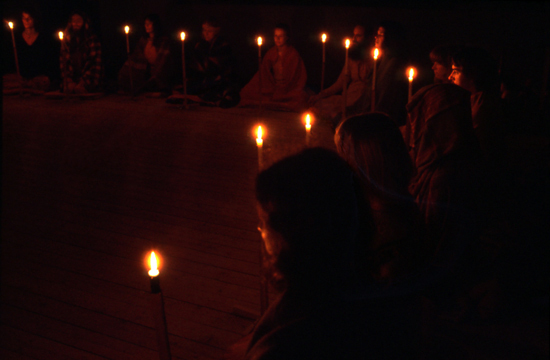 The remaining photos are by Swami Janakananda. The enamel painting in the part about the free state is by Swami Janakananda. The picture of a fresco is from Teotihuacán in Mexico. The chakra man is seen depicted in many contexts, both in black and white and in color; this is from Sir John Woodroffe‘s book “The Serpent Power” (Ganesh & Co.) first published in 1918, and it must be assumed to be the original. 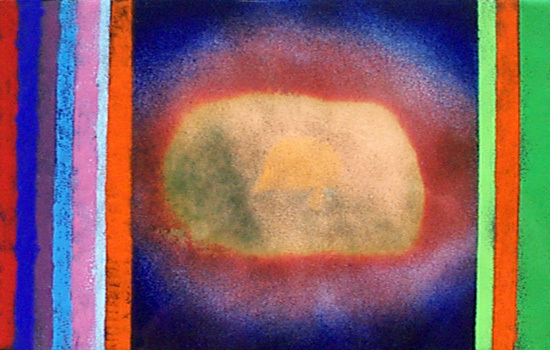 Here, the nadis are crossing each other between the chakras; they should, however, cross each other in the chakras, according to the way it is taught in Laya Yoga and Prana Vidya – evidently the artist who is illustrating is not always a yogi.